The bloodbath continues as the company grapples with news of another investigation. Shares of MiMedx Group (NASDAQ:MDXG), a regenerative medicine company, dropped as much as 22% in early morning trading on Monday. As of 11:10 a.m. EST, the stock was down 13%. The fall is tied to a news report today that the company is under investigation by the U.S. Department of Justice. Bloomberg reported on Monday morning that federal authorities are looking into MiMedx's government sales practices. According to sources familiar with the matter, MiMedx has allegedly been overcharging the government for its tissue-repair products. What's more, the article claims that the Justice Department is also investigating MiMedx's distribution practices for evidence of inappropriately booking sales of products that hadn't been ordered. MiMedx responded that it was not aware of any investigation by the Justice Department and that it had previously disclosed its cooperation with a Securities and Exchange Commission investigation into its revenue recognition practices. The company has denied all wrongdoing. Either way, traders are not taking this news lightly and are selling off shares hard in response. 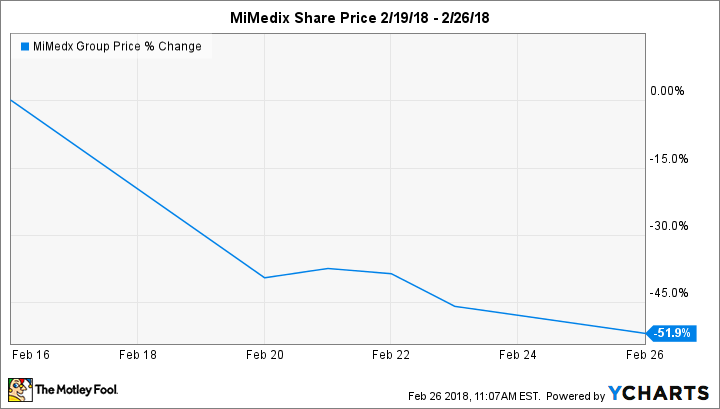 The last week has been absolutely dreadful for MiMedx Group's shareholders. Shares were slammed on Feb. 20 after the company said that it was delaying its earnings release date in order to conduct an internal accounting investigation. Three days later, the stock was hit again after The Wall Street Journal revealed the company had failed to comply with the Physician Payments Sunshine Act. Including today's plunge, shares have been more than halved in just the last week. It remains unclear whether the company has done anything improper so it is impossible to determine if today's tumble represents a buying opportunity. Given the huge uncertainty, I still think the smart move is to monitor this story from a safe distance.